Reliance Jio has been testing its fiber to the home (FTTH) service, GigaFiber since quite some time now. With this service, Reliance aims to disrupt the broadband market in India with affordable Internet prices. In a bid to further strengthen its role as a telecom operator, Jio is trialing a new Triple Play plan which is an all-inclusive plan offering Internet, TV and unlimited calling facility. According to a report by TelecomTalk, Reliance has rolled out the Triple Play plan to its employees. The plan comes with 100GB of data, Jio Home TV subscription, unlimited voice calling and access to Jio Apps. With this plan, users will have to pay just one bill for Internet, TV and calling facilities. The benefits of the plan are valid for 28 days. Interestingly, the report shares a screengrab of the details about the plan. In it, Jio Home TV has been mentioned distinctly which is the first time we have confirmed proof of Jio’s IPTV service. It was previously called Jio GigaTV but now we have substantial proof that it will, in fact, be marketed as Jio Home TV when it launches. Apart from the Triple Play plan, Jio is offering its usual plan which carries 100GB of data at 100Mbps and is valid for 30 days. In addition, subscribers of the plan also get 1000GB bonus data. 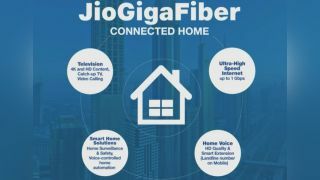 There is no official word on the launch date of Jio GigaFiber or Jio Home TV but the report mentions that the telecom operator is preparing for a Ready for Sale (RFS) rollout soon.